Being a gamer is no joke. You rely on flash speed reflexes and quick-witted decision-making to continuously stay ahead of your opponent. But no gamer will ever be complete without the right equipment, right? Choosing the best gaming materials to keep your head in the game and boost your chances of winning will give your game a better advantage. So, let’s see, what exactly are the best gaming equipment that you must have to improve your game and make your gaming experience better? First of all, you need to settle in a comfortable place to keep you ‘in the zone’. That said, so you have to get the best gaming chair for you to be comfortable while playing for extended hours. Secondly, you need the best gaming keyboard that will respond as quickly as you - a keyboard that will easily follow your commands and stick with them no matter what. Let’s face it, your desktop came with a keyboard that’s just meant for ordinary use like typing emails and book reports. But that’s just about it. There is a special relationship between a gamer and his or her keyboard. And a gaming keyboard in 2018 is the only thing that can sustain the needs of an élite gamer. Why Should You Choose A Membrane Gaming Keyboard? Why should you choose a Mechanical Keyboard? What’s the difference between a membrane and mechanical keyboard switch? Why are mechanical keyboards more expensive? 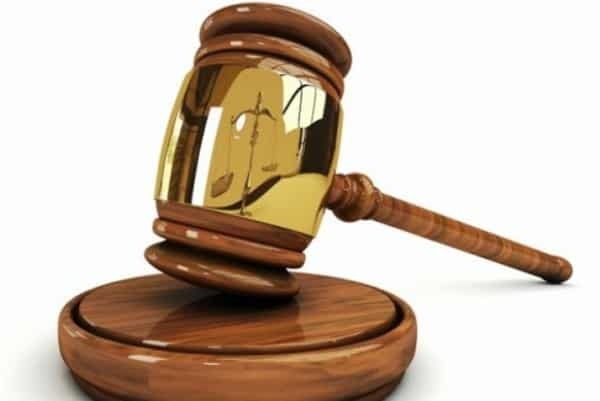 What is the N Rollover Key for? What is Reactive Typing or Type Lighting? Is buying a gaming keyboard worth it? Is my gaming keyboard USB port for 2.0 or 3.0? Why don’t most mechanical keyboards come with a wireless version? Choosing a keyboard for gaming is actually just as difficult as accompanying your girlfriend to shop for a pair of shoes. There are tons of gaming keyboards out there and you need to be really particular about which type of keyboard you need and which features it must have to boost your gaming experience. We know how it feels, so here are some considerations to make in choosing the best gaming keyboard before we talk about which ones really are the best in the market. This is the main consideration that most gamers SHOULD consider. But, oftentimes we commit the mistake of just choosing a keyboard that’s labeled as a ‘gaming keyboard’. What we don’t realize is that when we think about choosing the best gaming keyboard in the market, it’s actually by choosing what type of keyboards they are, how different are they from each other, and how does that help you as a gamer. Now, the big question here is, what are the different types of keyboards? There are two types of keyboards in the market: membrane and a mechanical keyboard. So, what’s the difference between membrane and mechanical keyboards? The types of keyboards are determined by their switch types. Keyboards use two different switch types, an attached and a detached switch type. The detached switch type is that of a mechanical keyboard while the attached switch type is that of a membrane keyboard. A mechanical gaming keyboard is the basic type of a gaming keyboard with each of the keys attached to a button that corresponds to a certain letter, number, character or function. They are literally those buttons that you can remove and re-attach to its switch. Those noisy large buttons that often came with our desktop are mechanical keyboards. It is the most common type of keyboard we can find in the market. Though mechanical keyboards are fairly common, gaming mechanical keyboards are designed differently from the typical IBM type keyboard that’s generic to any desktop. A membrane keyboard is definitely different from a mechanical keyboard. You see, a mechanical keyboard has those tiny buttons that you press. A membrane, on the other hand, is like a whole pressure pad. It doesn’t come with those buttons we are often used to. Membrane keyboards are lighter and the letters are only separated by outlines. As compared to the mechanical keyboard, a membrane keyboard is more flexible and much more portable. Instead of the use of switches, the keyboards rely on an electrical circuit that keys in the character you are pressing. A keyboard must be very durable to face the overuse and abuse of a gamer. Gamers are really into hard presses and pressure key-ins and a great gaming keyboard must be able to withstand all of that. Durability is definitely one of the most important factors in choosing the best gaming keyboard. Let’s face it, we even bust our frustrations on our keyboards sometimes when we happen to lose in the game, right? This is one feature that is very important to any person who spends a lot of time in front of the computer. Whether you’re a gamer, a student, or person who often does a lot of typing, anti-ghosting is one great consideration to make. What is anti-ghosting, you ask? It is also known as key rollover, a quick response of a keyboard to your key-ins or presses. In other words, it checks just how many presses you make all at once and how well or how accurate it registers them. Fast typers know exactly how important anti-ghosting is. One of the biggest problems we always encounter when typing is that some of the letters we press aren’t registered and we have to go back to our text and retype them. That goes for many instances. Your gaming keyboard must be able to cope up with your speed of typing. And honestly, gamers like you are really quick to press on those characters on your keyboard. Ghosting happens when we press two keys at a time and only one or two of them gets registered. Ordinarily, the generic keyboards that we get have a standard of 1 or 2 key rollover (1/2KRO). This means that they would only register one or two key press at a time. Gaming keyboards have a standard of about 6 Key Rollovers at a time, thus promoting lesser ghosting. One of the things we love about our keyboards are the shortcut keys. That way, with just a few press of a couple of buttons, our lives are made so much easier. What’s great about gaming keyboards are that they are able to register keystroke and mouse sequences and respond to certain actions. Software customization allows you to command your computer into performing tasks just by pressing a certain sequence of keystrokes and it can only be done with the use of software that is incorporated in gaming keyboards. Although commands can also be done using standard computer keyboards, they are limited and most of the time; you have to install a software on your computer in order to do that. Gaming keyboards have macros too. They are preset buttons on the keyboard that further help and enhance a gamer’s quick ability to respond during game time. They are insanely helpful because the macro key can trigger ridiculously helpful combos and load profiles, commands, and your favorite presets. Honestly, one of the major factors in buying a certain gaming keyboard is the price. We used to skip the features first and go for the price. Gaming keyboard prices differ from one another. In fact, features and brands are the ones that dictate just how much a gaming keyboard costs. A gaming keyboard would cost about $30 to $200. This huge price range depends on so many factors like the switch type, the build, the quality and the overall gaming experience it can provide. However, you can actually choose a great keyboard for a cheaper price but still get the benefit of awesome features that come with expensive premium brands. But when we buy, instead of considering how much we’re going to put our cash-in initially, we should answer one question every time we’re going to buy a gaming keyboard. We should always be meticulous and check, ‘is it really worth it?’. A lot of people think that backlighting is quite a luxury when it comes to buying a gaming keyboard. Not a lot of people know that whether in the dark or in the light, gaming is always active. And one of the advantages of getting a gaming keyboard with backlighting is a great extra feature especially if you’re a nocturnal gamer or you’re a gamer who likes playing in the dark. Gamers do prefer playing games in the dark. The gaming experience just seems more surreal and more appealing when we’re gaming in a dark environment, but it comes at the price of not being able to have full-vision over everything else. And for that reason alone, backlighting becomes a really helpful feature indeed. Illumination will make it easier for you to up your game. Besides, not only does it offer visibility but it also offers a great deal of comfort and it really just looks awesome. Backlighting also has features that may change color, shade or brightness depending on what’s happening to your game. Like we said, we’re pretty sure that you’re going to up your game when you have a gaming keyboard with backlighting. You can enable reactive lighting or timing depending on your game. So whether you die and respawn or your timer runs out, you can set your keyboard lighting to change colors and track time for you. So in a sense, other than aesthetic value, backlighting is a really gorgeous convenience. Now, let’s get back to business. You already know how to choose a great gaming keyboard. It’s time to find out just what awesome gaming keyboards are out there among the pool of thousands to choose from. 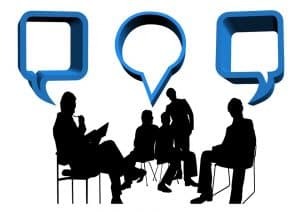 With so many brands and multiple features, it’s a great challenge to choose the right one. So, let us help you out. We’ve chosen the 10 best gaming keyboards that will really boost your gaming experience. The Corsair K95 is the peak of all keyboard greatness--that is our opinion. If you’re really looking for an awesome gaming keyboard without having to consider the cost of ever buying one, then this is the best item we have on our list. Of course, with many good reasons too. Let’s check it out. The Corsair keyboard has a strong and durable frame which is made of an aircraft-grade anodized aluminum making it a really lightweight yet durable keyboard. It’s literally meant for heavy-duty use, overuse, and abuse. You’re guaranteed that you will be using this for a lifetime of gaming. The Corsair K95 is one of the best gaming keyboards on our list because it uses the Cherry MX Speed. This means that you only need to press lightly on your keyboard and it will quickly register to your intended keystrokes. What’s also great about it is that the keys are 100% anti-ghosting guaranteed. Since it uses the Cherry MX Speed, you’re sure that you are making precise keystrokes that are easily registered by the keyboard and quickly transmitted to your computer or your game. It also comes with a full key rollover which means that it can register up to 8 key rollovers. But, you have to remember that it would also depend on your computer. So in some instances, like the MAC, they would only recognize up to 6 key rollovers. The Corsair K95 functions so well beneath your fingertips because it allows full-customization of commands, controls, and backlighting. It comes with the RGB (red, blue green) in full spectrum thus allowing you to customize command controls and even register multiple presets of your preference. This gaming keyboard has additional 6 macros with 6 dedicated keys found on the very left side of your keyboard. What’s also great about it is that it has an 8MB onboard storage of profiles that is completely independent of your computer’s software making your gaming a better and easier experience. The 6 macro keys are also contoured so that you won’t accidentally press on them while doing other tasks on your computer. Although the 8 MB onboard storage sounds rather small, it is a pretty sizeable memory to keep your presets. Besides, it’s just a preferred set-up command and each command won’t really take up an entire MB for that matter. Since it has an independent storage meant for your gaming presets, you can bring this keyboard along with you so that you can easily set-up your gaming preferences and simply go straight to your game. The Corsair K95 gaming keyboard has another USB port where you can connect your mouse or your headset or speakers. This allows you to listen and directly have control access to your multimedia through your keyboard without having to disturb your game. It has a detachable wrist rest to alleviate the tension we often feel while typing for long hours on our keyboards. What we love about the Corsair K95 is that even if it was launched in 2016, its features are still unbeatable by most upcoming gaming keyboards on the market. We love that it’s fully customizable to our gaming and typing preferences and most of all, the keys are quite light and easy to press that you are guaranteed to have lesser tension on your fingers once a long day of typing or gaming comes to an end. The keyboard is relatively lightweight as compared to most mechanical keyboards and it sure is durable. Unfortunately, this is a luxurious upgrade. Pricing at the peak of our price range, the Corsair is a gaming investment on your part. What’s also sad is that you’d have to really take your time in programming the software -- some people had a hard time doing so, thus not being able to successfully customize and make full use of the backlighting. Overall, this is a true gaming upgrade. If you’re a serious gamer with the need to upgrade your gaming system, then this is one item that you need to up your game and boost your gaming efficiency. With full controls simply at the tip of your fingers, you are in full control of your game and everything else in it. It’s quite hard to find a decent wireless gaming keyboard. Coming across the Logitech G613 mechanical keyboard, this is simply a great piece of equipment that surpassed our criteria for a wireless gaming keyboard. It has features that are even better than other mechanical gaming keyboards. So, here's the lowdown. One of the biggest plus factors for the Logitech G613 is the fact that it is wireless. But despite that fact, it runs only on 2 AA batteries and can run for 18 months of heavy and constant usage. But in order to save on battery life, one great gaming keyboard aspect that must be sacrificed is the backlighting. The Logitech G613 has no backlighting so aesthetic and colorful customizations are definitely out of the question. What’s great though is that it comes to par with great mechanical keyboards and is a serious contender for the best mechanical keyboard over $100 price range. This gaming keyboard uses a Romer-G Keyboard switch. The Romer-G keyboard switch has a quick actuation time of 5 milliseconds and has an actuation of 45 cN. This translates to a faster registration to your computer despite it being a wireless keyboard. It also means that your keystrokes will easily be registered to the computer even with a light touch of a key. Since Romer-G switches are shorter, you can type in lightning speed which is a bonus for typists out there. The Logitech G613 gaming keyboard is pretty durable even though it is made completely of plastic. With gaming keyboards having an average clicking lifespan of 50 million presses, you’ll be delighted to know that this wireless gaming keyboard has a lifespan of 70 million clicks per button. That’s a guaranteed ‘couple years extra usage’ for your better gaming experience. It also comes with 6 macro keys where you can program 6 G profiles. This makes complex actions much simpler for you. Another great feature about the Logitech G613 is the fact that it comes with an awesome 2.64GHz Multi Host + Bluetooth making sure that you are fully connected to your computer even at distances reaching up to 10 meters away. The multi host connectivity allows your keyboard to connect to other Bluetooth wireless devices at the same time you’re connected to your computer. It also comes with a smooth matte palm or wrist rest to relieve the tension on your wrists and hands. We love that this is just as good as any wired mechanical gaming keyboards. With great reaction time and awesome basic gaming necessities, it will really sustain your basic needs as an elite gamer. It has a great feel to the touch switches making every key stroke feel nice and comfortable to the touch. If you’re looking for its wired version, you might want the Logitech G413 which is an upgraded mechanical keyboard but at almost half of the price of the wireless version. Its features are found in mid-range gaming keyboards but since it is wireless, the price is twice as much as expected to pay for the features that it has. Also, it doesn’t have backlighting because it would be too much for the battery, what a bummer. This is still a great mechanical keyboard nonetheless. In fact, this is the best wireless gaming keyboard in the market because it has high-end features and quick controls and short reaction time that is ideal for most gaming keyboards. Though its features are equal to mid-range wired gaming keyboards, this is a high-end wireless mechanical gaming keyboard. Some gamers love using the mechanical keyboard but a lot of them say it’s too flimsy or that they’re too stiff and just plain annoying to listen to. Well, not anymore because we have on our list the best membrane keyboard that you can probably find on the market and with plenty of reasons why. 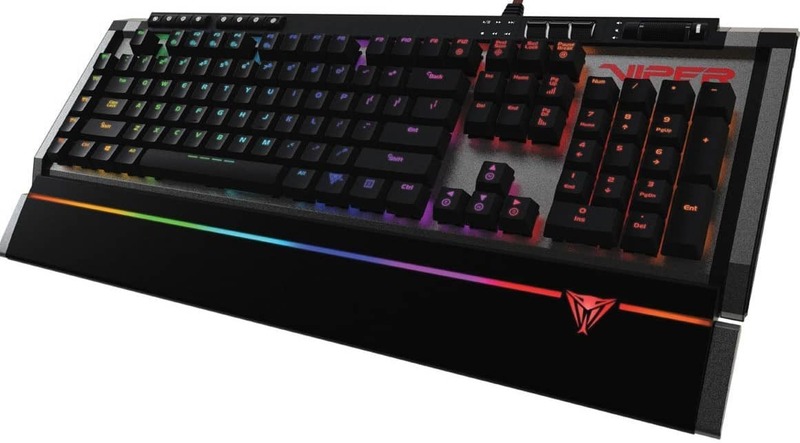 Getting our main attention as a membrane keyboard for gaming, the Razor Ornata Expert offers a great deal of features that can compete with any high-end mechanical keyboard. First of all, the design is fantastic. The way the keyboard looks is a wonderful addition to your awesome expert game center in the comfort of your home. This membrane gaming keyboard has a custom keycap design that allows you to have better keystroke responsiveness. The keys are made shorter only allowing you to have mid-height keys thus improving key presses and even improves the way your keys are pressed and feels as they are pressed. The Razor Ornata Expert membrane gaming keyboard also allows a very convenient programmable backlighting keyboard effects. With a full spectrum of colors ranging up to 16.8 million colors to choose from, you can practically customize every bit of your presets to correspond to different backlighting options. You can all set up your backlighting through the Razor Synapse software that this gaming keyboard comes with. You can also set up your preferred timing effects to manifest through your backlights. 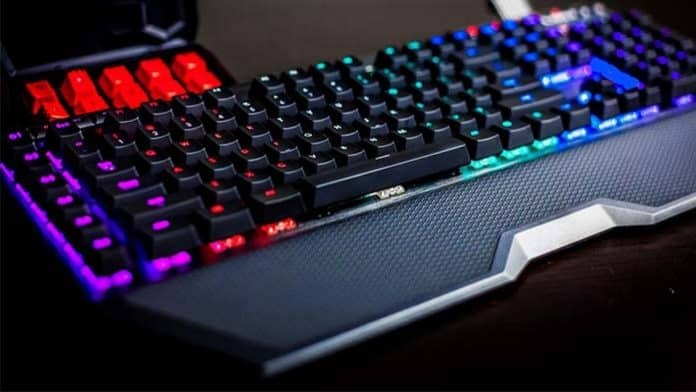 The great thing about the Razor Ornata Expert is that you can fully sync your keyboard to perform various lighting effects corresponding to various commands and executions as lighting effects from breathing, reactive, ripple, wave, or starlight. All of which are automatically configured through the Razor Synapse cloud-based configuration. Another great aspect of this mecha-membrane gaming keyboard is its advanced anti-ghosting technology that allows you to make ten commands at a time. That’s an advanced feature that will really boost your gaming experience to a max. You’ll also be able to execute commands simultaneously without a miss. It has a 10 key rollover that helps execute commands quickly and effectively every single time. This is a real marriage between a membrane keyboard and a mechanical keyboard thus allowing you to maximize the potentials of both gaming keyboard types. This keyboard uses a rubber membrane for a soft touch and a tactile click of a mechanical switch for quicker responsiveness. It has a nice and smooth wrist rest providing you with sheer comfort as you concentrate on playing with your game. The backlighting is a real delight. They are superb since each key is individually lit with light emitting diodes. It’s also a great gaming keyboard because not only is it cheap but it offers exactly what you can get for an obviously more affordable price compared to real high-end gaming keyboards. The only problem you will have with the Razor Ornata Expert is its Razor Synapse. It can be complicated and with so many possible configurations that you can do, you will often find yourself mixing up the commands and settings, thus leaving your keyboard with different key lighting effects and shades. This is a sure winner for the economy price because not only does it offer great quality customization, lighting effects, and supreme quality control, but it also offers great responsiveness and typing feel for a maximized gaming experience. Known as one of the best gaming keyboards in the market, you’re guaranteed to get the most of the G.Skill Ripjaws KM780R. With the latest and up to date gaming keyboard features, you’re going to be optimistic about every feature this gaming keyboard has. This keyboard comes with the various option of choosing different Cherry MX switches ranging from Red, Brown, and Blue. These are the different types of Cherry MX gaming keyboard features from linear to tactile non-clicky, tactile clicky. You can literally choose which type of switches you’re very much comfortable with. Now, if you’re not sure what those types of switches are, then move on and read through our article and you’ll know exactly what these different switches are from Cherry MX. Anyway, back to the awesome features of this gaming keyboard, you can literally customize the features of your RGB LED lighting. Actually, you can even choose whether or not you’re going to use an RGB LED backlight or a simple RED backlight for your gaming keyboard. You can set your reactive typing to custom configurations based on your profile presets, time preferences, color preferences, lighting patterns of your choice and various lighting needs. And you can even choose from 16.8 million color spectrum of colors for the best lighting effects of your choice. What’s also great is that it comes with a built-in onboard profile storage for setting your profile presets and have quick and easy access to them. This gaming keyboard is able to store up to three complete sets or modes for macro, key, and lighting configurations. It may not sound enough but as a gamer, you’re sure that those complete sets of configs are sufficient enough. This G.Skill RipJaws gaming keyboard is incredibly sturdy because it is made of strong military-grade aluminum. This is a real deal because your keyboard can withstand your bomb attacks and your crazy hard abusive key presses and overuse. Not only are your keyboards study, they are also really good-looking too. So, it sure is a piece of nice looking equipment to add to your supreme battle station. It also comes with a full N-Key rollover and 100% anti-ghosting technology. You also get 6 dedicated macro control and mode key selection. These are only added built-in functions to make your gaming so much easier and lighter. Your keyboard also, of course, comes with the typical windows key lock and additional backlight toggle key and even a timer button. Aside from those added features, this gaming keyboard has other built-in features like a mouse cable holder-- you don’t really want any of your mouse cable to tangle with other cords right? It also has a USB pass-through and even an audio line-out and mic-in jacks these are additional conveniences for a better gaming experience. They practically have thought of everything in adding features in this awesome gaming keyboard. From lighting to other external features, they have it all. That's what made us love this gaming keyboard. With so many awesome things to love about this gaming keyboard, the only problem we have with it is that it is pretty darn heavy. Weighing in at 3.4 pounds, it’s the heaviest on our list. And another issue with this gaming keyboard is the sheer size of it. It is really massive. The huge size and the heavyweight won’t allow a flexible play. Standing at a high rank in our list the G.Skill RipJaws is a really magical keyboard when it comes to providing you with a greater gaming leverage against your opponents. However, with as much as it can offer, it also has a huge weight and size issue that can prove to be problematic for gamers especially when they’re looking for a gaming keyboard that allows them to play in different places, areas and even preferences like game playing with the keyboard on their laps. SteelSeries lives up to its name as a brawny piece of gaming equipment. The steel back series makes their keyboards with the strongest plastics and reinforced with steel back plate battle-hardened to perfection. Made with only the best quality material, you’ll definitely be holding on to this gaming keyboard for a really long time. This mid-range gaming keyboard has great quality built plus features that you will find convenient and essential to your gaming battle station. Considering that it has tons of multiple features like fully customizable options, it’s pretty great for the price you’ve paid it for. It offers customized macro settings for up to 6 profile presets, and programmable keys. With a stunning blue LED backlighting, you will be able to see your keyboards even in the darkest gaming room. It offers full visibility of your keys anytime or anywhere. You will also love that you’re going to have a smooth typing feel with the Cherry MX Red switch that it uses. It’s easy and light to the touch. What’s more is that it comes with great anti-ghosting properties. You’re guaranteed that no matter how quick you type and no matter how many keys you press at a time, your letters would surely register. It’s also great that not only the keyboard will last through years of overuse, but you will also be able to use it properly for up to 50 million clicks for each button. And in every press of the key, the feel will always feel the same. No insensitivity or mushy feeling as time goes by. What we really love about the Apex M500 is its N Key Rollover. You’ll be surprised just how much your gaming will improve with its own full 104 N-Key Rollover. We also love that it is relatively lighter than most mechanical gaming keyboards out there. On the other hand, it does have some cons. We really love this keyboard, but we look for what it is lacking -- it only has one LED color backlighting. Though it has customizable features, the fact that it doesn’t come with various reactive typing features does become some sort of a turn off. Others keyboards of its kind within its price range do have multi-colored reactive typing. The price is average and just absolutely right for this mechanical keyboard. The fact that you get the features that you need and want in the Apex M500 makes every bit of your money worth every penny. So, for an improved gaming efficiency, you’ll definitely want to include this in your list of top choices. Yet another lovable mid-range gaming keyboard on our list. This is a sure winner for those who want a gaming keyboard to get as many features they can find at the lowest possible price. The Thermaltake’s Poseidon Z is one option of great consideration. You will love that it has sturdy steel back plating for a much stronger and sturdier build allowing you to have constant and heavy use of your keyboard for a long period of time. With 50 million clicks to brag for each button, it’s a sure winner for years of use. What’s also great is that even if it was launched in 2016, the Poseidon Z is still a great gaming keyboard that will really help boost your game. 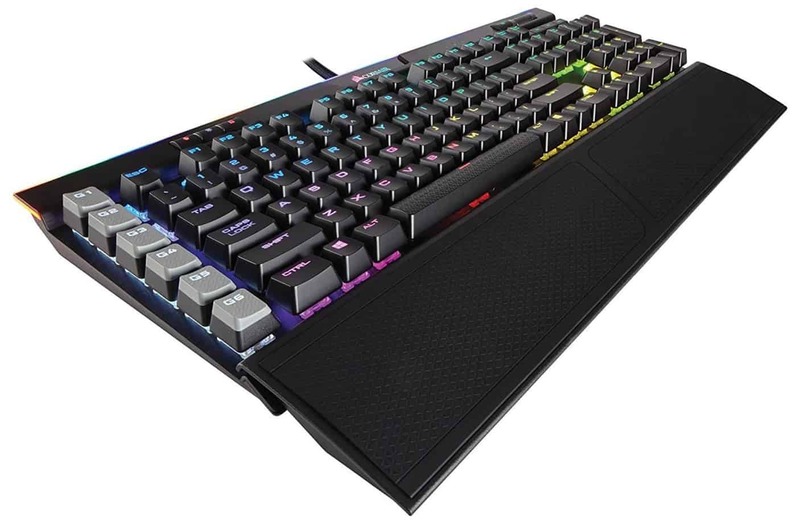 It comes with the full RGB spectrum of colors having 16.8 illuminated color mechanical keys that deliver a lovely color spectrum that is fully customizable. It allows you to set it to five different profiles and multiple color configurations of your preference. It also comes with its own built-in memory and windows software installation to allow a better and easier access to making your profile presets that is completely independent of your own computer’s software. The keyboard also comes with quick macro key functions and five re-programmable function keys. This gaming keyboard has a Windows lock key function so that you won’t get frustrated when your game suddenly minimizes because you accidentally pressed the windows key. It also uses a smooth tactile clicky Cherry MX Blue with a soft touch keystroke allowing you to quickly register your pressed key and still enjoy the sounds of your gaming keyboard popping as you go. We love that this item comes with the full RGB color spectrum and its reactive typing is pretty on point. This is a feature that not a lot of mid-range gaming keyboards have in order to lessen the cost of production. Another thing we love about it is that it comes with its own built-in memory for better independent preset profile storage. On the downside, the keys end up becoming flimsy in the long-run. The keys seem far too tall for the Cherry MX Blue Switch so they do get crooked after a couple years of heavy usage. It is rather plain-looking as well. What you will love about getting this gaming keyboard is that it will give you the best features that you can also get from a high-end gaming keyboard. We love that it’s sturdy, smooth and definitely adds to your gaming efficiency. You’d want a hyperspeed keyboard that allows you to maximize your full potential as a player, right? Then boost your battle station with the right aggressive gaming equipment powered by the Patriot Memory Viper V770. This is yet another sturdy gaming keyboard that bounds to overpower an eternity of your gaming lifespan. It is made only with aircraft grade aluminum metal framing. With that said, you get a keyboard that you can fly with--on your game, that is. The premium grade aluminum does add to the weight but it sure can handle more than just a horrible beating from aggressive elite gamers. The keyboard is a real stand-out because it has a front aluminum panel locked in with a plastic bottom support. It comes with a customizable reactive key typing that allows you to personalize your color spectrum to react to certain key types, commands, and presets. You can preset your profile anyhow you want and create a responsive backlighting of your preference with keys up to 16.8 million colors to choose from. It also comes with an awesome lighting effect that extends all the way up to your wrist rest. The wrist rest is detachable so it’s pretty convenient to use when needed. You can use up to 108 macro key to program and reprogram and you are allowed to have your very own dedicated multimedia controls. The keyboard comes with five additional macro keys dedicated to gaming presets which you can easily reprogram and set yourself. This gaming keyboard uses Kailh red switches. They are far different from the Cherry MX switches but they do offer maximum responsiveness and minimal noise, which is great for gaming. However, an expert gamer would feel a bit awkward using the Kailh red switch as a tool for effective gaming because it won’t allow you to have switch selections. It does come with other high-end features like an audio pass through and a key puller which makes this gaming keyboard even more enticing to the wide gaming audience. We love that this is a high-end gaming keyboard on the lower side of the price range. Anything over $100 is pretty expensive but comparing it to a $199.99 gaming keyboard, this is much cheaper and yet it comes with the right features. It looks absolutely stunning and it does live up to its name. This keyboard works aggressively along a serious gamer with its high-end features and additional likable add-ons. Not a lot of gamers prefer using a keyboard that uses Kailh switches because, well, it’s not really made for gaming. But with the Kailh Red switches, it’s still pretty efficient like a gaming keyboard. Aside from the keys, this is a pretty huge keyboard even if you detach the wrist rest. It still consumes quite a big space and the fact that it has metal framing makes it pretty heavy on the lap too. This would have been a great contender for our top pick as a high-end gaming keyboard but with some cons that just can’t be missed, it's not worth all the hype. It is, however, still a phenomenal gaming keyboard giving you the best it can offer with quick active responsiveness and low anti-ghosting properties. It is incredibly durable and definitely easy to manipulate. With a price less than the average cost of a mechanical keyboard, this is a great cry for awesome gaming keyboard without the hassle of considering the cost. Other than it being cost-effective, it is also space-saving. This is surely a minimalist’s ideal keyboard because it was designed to be compact. But don’t be fooled because it can take a serious beating even from the most aggressive player. That’s due to the framework of this mechanical keyboard which is made of solid aircraft-grade aluminum. That literally means that the material used to make this keyboard has the same quality as those used to make airplanes. So that's a whole lot of beating it can take from any gamer. You will love that this Redragon keyboard has plate-mounted keys, double-shot injection molded keycaps, and high-end switches allowing you to press hard on the keys and still have a long-lasting gaming keyboard. You also have less to worry about especially when those commonly used keys start to fade away. Since the keys use a Cherry MX blue switch, it offers great clicking sounds with smooth tactile presses and definitely a great keystroke response. The keyboard comes with a sweet bright Red LED backlighting. However, the backlighting is not software programmable but simply a nice touch to add for certain aesthetic purposes only. Still, it lives up to its nice name Red Dragon. The brightness can be adjusted to 10 different brightness levels. With an actuation of 50 cN, you are guaranteed to have quick responses from your keyboard especially during game time. Another great aspect of this small gaming keyboard is that it comes with an awesome gold-plated corrosion-free USB cable. This means that your keyboard has a quick reaction time for it to register the keys you have pressed. We love that it is cheap, compact and has great features that measure up to the greatness of most mechanical gaming keyboards out there. With a 50 million clicking lifespan for each button, it’s pretty durable. We also love that it’s small, cute, and compact, and offers a great backlighting. You’re definitely getting more than what you paid for with the Redragon K552 since its price tag is on the economy level but its features are those of the mid-range gaming keyboards. We do love the features of this keyboard except for the backlighting. The fact that you cannot customize the backlighting and add other preset keys to your software gaming keyboard is what’s lacking. Gaming may be a breeze but you have to start setting up your profile every time you play on your computer. It is pretty short too, so it doesn’t come with the extended keyboard keycaps but it’s barely a loss for gamers out there. Catching our attention as a great budget gaming keyboard, this sure packs a lot of punch. This is a great deal for a mechanical keyboard and we wouldn’t wonder why anyone would miss the chance to have it among their pool of top choices to upgrade from a typical desktop keyboard. You probably have heard of Das Keyboard as a manufacturer of high-end gaming keyboards. Well, it’s pretty definite that you’ve heard great things about this brand. But with many keyboards under its belt, which one is a great gaming keyboard? Here’s one keyboard that we happen to like a lot. The Das Keyboard 4 uses Cherry MX Blue which means that it is highly responsive and very much a great gaming keyboard companion due to quick-reactive typing and 100% anti-ghosting properties. It has a high key rollover as well due to the efficacy of the Cherry MX Blue. Gamers like the tactile feel of the Das Keyboard 4 along with the gentle appeal of the clicky sounds it makes in every press of the key. Other feature of the Das Keyboard 4 that you will like is the noticeable volume knob at the top right corner of the keyboard. This is pretty convenient since you don’t really need to find other keyboard controls to hike up the volume if you needed it to. In addition to the volume, it has USB passthrough and both of them are 3.0 USB super speed ports. The keyboard -- devoid of any backlighting -- uses laser etched keys on the keycaps to prevent them from ever fading in the long run. This is one problem that a lot of gamers face, when the letters or characters on the key caps end up fading away due to overuse. What’s surprisingly great about the Das keyboard is that it is very sturdy due to its anodized aluminum top panel and high-quality plastic support. So even if you do use it heavily for years, it will stand the test of time. A lot of people find it extra annoying to have long cords for keyboards but not all gamers agree. In fact, plenty of gamers are already seated away back from their oversized gaming screen to improve better game play, and that is why the Das Keyboard comes with a staggering 6.5-foot long USB cord. The Das Keyboard 4 focuses more on the gaming efficiency of the gaming keyboard rather than the use of excessive gaming features like the disruptive backlighting--which other find to be a distraction to their gaming experience. What’s great is that it is a stunning gaming keyboard with awesome controls and commands and easy typing response. On the downside, the lack of full customization of macros does put this to the lower end of our list. With lesser customization, gaming efficiency is also decreased. So even if it does have wonderful features, command customization sets and profile presets are still bonus points in owning a gaming keyboard. Easy controls, great anti-ghosting properties and wonderful keyboard features and design. These are the words that come with the Das Keyboard 4. Though it has other improved models, the DAS Keyboard 4 seems to be at the top when it comes to responsiveness thus putting it in our choices of the best keyboards. If you’re tired of all those overly excessive gaming keyboards that are pretty distracting when you get your hands on them, you might want to switch to something much simpler. This CM Storm gaming keyboard is definitely a simple gaming keyboard but offers just the right punch for your enhanced gaming experience. This keyboard comes with a durable full carbon fiber plastic frame, make and support. It is somewhat flexible making it a great gaming keyboard to put on your lap or anywhere else around the house. With such light materials, this is among the lightest items on our list of the best gaming keyboards. What’s also great about this simple gaming keyboard is that this uses a tactile clicky Cherry MX Blue switch. Though a bit noisy, it is pretty responsive with quick action typing accuracy and enhanced anti-ghosting technology making it a great item for you to have and own. Aside from the Blue switches on standard buttons on your keyboard, it also uses the Cherry MX green switches on the function keys, Escape key, caps lock key, and the space bar. An added advantage is that the keys are made in mid-height to allow better registration of the keys that you press. That makes your life much easier and more effortless in typing. This will also allow you to make full commands all at once during your game. This gaming keyboard is smaller than the other keyboards, so it’s a perfect companion for those who love sitting in awkward places and spaces. This allows you to play with all the comforts that you can possibly have. Besides, you don’t want a keyboard to be the only and very reason why you’d lose your game, right? Furthermore, it has a switchable OS and key layout so that it can accommodate different operating systems from Windows to Mac to QWERTY, Dorvak, and Workman. It can be done using simple shortcuts. It has a standard six key rollover and N-Key rollover for maximum precision in making commands. The main objective of this keyboard is efficacy. It only offers your great operations and typing controls at its best. It has multiple options of choice and preferences as you customize your gaming presets. You can also enjoy your game without the hassle of ever wondering if you keyed-in the wrong command. Unfortunately, what you see is what you get. The simplicity of this keyboard may be an advantage for many gamers out there, but certainly not for everyone who still longs for the added features a high-end gaming keyboard can offer like customized lighting, macro keys, higher speed typing, anti-ghosting technology and more. This may be a simple keyboard once you look at it but it offers more than simple features and effective typing. It has great typing accuracy, speed, and durability with great keycaps, command systems, and operating command configurations that are fit for your gaming needs. If you're looking for a keyboard that gives you all the gaming boost you need but with less excessive decorum, then this is certainly the best companion gaming keyboard for you. Our list considers the best keyboards of different types in the market. So from gaming and daily ordinary use, these keyboards offer the greatest quality you can ever get from a computer. Now, there are still some other things that you need to find out about a gaming keyboard, that is if you really want to get the best out of there. And you’d want to make sure that you are putting your valuable money to proper use. You wouldn’t want to question your choice later on, right? So here’s the low down on Mechanical and Membrane Keyboards. Membrane keyboards are the modern generation keyboards. They are recently gaining attention from the gaming world and are beginning to offer great quality gaming experience to different players. One of the greatest benefits of a membrane keyboard is that they are much cheaper than a mechanical keyboard. They are also very light and portable, and it is perfect for a gamer who often moves from one place to another--common for gamers who love to compete in online gaming competitions. One of the things that we love about a membrane keyboard is that they are really quiet. You can barely hear those annoying typing sounds, especially if your partner or spouse just despises hearing the sound of the keyboard clicking the night away. Membrane keyboards are relatively waterproof too because there aren’t any spaces in between the keys for the water--or any liquid for that matter--to enter and penetrate the electrical circuit. When it comes to typing experience, mechanical and membrane keyboards aren’t so different. Actually, you’ll barely notice the difference--if there are any at all. A membrane keyboard uses plastic, rubber or silicone membrane. The typing feel is also different because typing on a membrane keyboard feels much smoother. Good things must come to an end. A membrane keyboard has some noticeable disadvantages. Lifespan is a sure concern to membrane keyboards since it can only handle about 5 million keystrokes for each key on average. It can easily wear out because the interior of a membrane keyboard uses plastic instead of the metal frames that mechanical keyboards use. Once they do wear out, they feel kind of mushy or too soft to the touch. Membrane keyboards are harder to clean despite it having a membrane to protect the electrical circuit inside, since they keys cannot be removed. With the membrane literally offering a protective lining over your electrical circuit, it also has a lower key rollover averaging at only about 3-5 key rollovers. And what’s more is that for most, it would require you to press harder on a key. Most gamers prefer the use of a mechanical keyboard than using a membrane keyboard. One of the primary reasons is the lifespan of a mechanical keyboard, which is on average has a lifespan of about 15 to 50 million key presses per button. That’s a lot, and no matter how frequent you type in a day, it still guarantees you a longer lifespan. A mechanical keyboard is also made of better quality material because an individual character on your keyboard has their very own electrical unit as compared to the membrane that has a major central electrical circuit. Another great thing about a mechanical keyboard is that the keys can be removed thus making it much easier to clean. And since the keys can be removed, you can purchase a set of keys to replace those that have already worn out. Or, you even have the option of customizing your very own keyboard. Without the membrane, key rollover is much higher than your average membrane and standard keyboard having an average of 6 key rollovers. Meaning, it’s more sensitive to your key presses than any other type of keyboard out there. It also doesn’t require as much pressure and effort in typing using a mechanical keyboard because there is no membrane pressing against your keystrokes. On the downside, a mechanical keyboard also has its cons and the biggest concern that most gamers do have is the weight. When it comes to serious gaming, there are times that your arms get tired, so you have to put your keyboard on your lap. Unfortunately, a mechanical keyboard is much heavier than a membrane keyboard. It can also be an advantage since your keyboard won’t move as much when you put it on your table, desk or typing space. Another set of cons when it comes to a mechanical keyboard is the cost and the loudness of typing. Mechanical keyboards are far more expensive than membrane keyboards. Though they are the standard type of keyboards available in the market, the best mechanical gaming keyboards are far more expensive, in general, than membrane keyboards. Other than that, it is pretty noisy too. They are very annoying for some, especially for those who have to listen to you playing your games. But for some reason, some players actually do enjoy the sound of their very own keyboard typing. If you’re a real serious gamer and you’d like a keyboard that requires less of your attention so you can focus more on a game, and you’re also a typist who really needs a high-end keyboard that will cope with your typing work for a long time, then the best choice for you would be a mechanical keyboard. The mechanical keyboard gives you a better advantage if you are a real heavy keyboard user, and if you’re pretty abusive too given the example that you end up banging on your keyboard because you either lost to your opponent or you had to respawn in an untimely manner. Don’t get us wrong though. Membrane keyboards are great keyboards too. But we would only recommend it to average gamers as well as the ordinary users of the keyboard like for students who would only require the need to type when making write-up or texts or etc. Knowing your needs is actually the best option to go. You should pick out a keyboard depending on your need and also depend on the frequency of your use. And for that reason, we give you all the freedom to choose which keyboard you’d like to get when you need an upgrade, and our best bets are all those we have on our list above. If you’ve decided to choose a mechanical keyboard, here is additional information that you might find handy when going through the features list of info about a certain keyboard that you’re looking at. You’ve probably heard about Cherry MX, right? Every time you start shopping for a mechanical keyboard, Cherry MX always seems to appear everywhere. What exactly is this Cherry MX? It is a line of switches produced by Cherry GmbH or Cherry Corporation. It’s a company that manufactures sensors, input devices like mouse and keyboards, switches, and contract electronics manufacturing. Most of the keyboards we buy in the market are manufactured with Cherry MX series of switches. Cherry MX switch quality in each keyboard is determined by their color. There are about 11 different colored Cherry MX series and classified under four types of keyboard switches. If you remove one of the keycaps on your keyboard, you will notice that the pressy little thing that sits in the middle has a certain color. Now, the color will define the quality of your keyboard. We will discuss the best recommended Cherry Color Switches you’d love to have as your keyboard for gaming. But before we get to that, let’s learn about Switch jargons to have a full idea of what common details mean in each keyboard we’re going to buy. What is keyboard switch actuation? Actuation is the amount of force you have to exert in pressing down on a key. The higher the number, the more pressure you have to exert in pressing on a key before it registers. Actuation is measured in terms of cN (centi-Newtons). The Cherry MX Black and Red switches fall under what’s called linear switches. These linear switches simply go up and down. They are considered to be the stiffest switches among the four types of Cherry MX switches. It requires you to put more effort in pressing down on the keys in order for the keys to register. You will often find them in keyboards with tall keycaps and also other gaming controls that require hard key presses to make sure that you really are clicking what you’re supposed to be clicking. The Cherry MX Black switches are much older and need more force to press them. 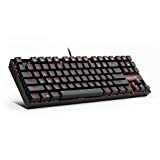 The Cherry Red MX is made as an updated version of the Cherry MX black, cutting about 25% off the pressure you exert in the Cherry MX Black switch. The Black requires an actuation of 60 cN while the red switches only require 45 cN. The Cherry MX Red are great for gaming because it only requires very little effort to pressing down on the keys. Tactile refers to how it feels when you press down on a key. You will notice that there is a bump when you press down on a key to let you know that the key pressed has been registered. A perfect example would be a Cherry MX Brown. They are a mid-range keyboard that is good for typing and gaming as a whole. These are the ones that produce loud clicky sounds. They also have a bump that lets you know that the key you pressed is registered. It is rather a more complicated switch because it’s designed specifically to produce a click sound. These are greatly used for typing keyboards but are not as ideal for gaming because they have an actuation of 50 cN. It isn’t ideal for quick response typing either because the clicking effect produces a recoil that needs you to press down harder or wait if you’re going to double tap on a certain key. The most common is the Cherry MX Blue. They would remind you well of the IBM type keyboards. You know the very old version of desktop computer switches that produce those really entertaining clicky sounds. Cherry MX Silent Red (Linear) is a quieter version of the MX red because it comes with a rubber piece to reduce the sound. It has an actuation of 45 cN. Cherry MX Speed Silver (Linear) is a switch with lower keycaps. If you notice, there are keyboards with lower key cap heights. The Speed Silver is simply a shorter version of the MX Red switch with an actuation of 45 cN. Cherry MX Clear (Tactile, non-clicky) is much stiffer because it has an actuation of 65 cN. Cherry MX Grey (Tactile, non-clicky) is typically used for the spacebar on clear keyboards. They are really stiff with an actuation of 80 cN. Cherry MX Green (Tactile, clicky) is a version of the MX Grey with a click. They are also used for a spacebar and has an actuation of 80 cN. Cherry MX White (Tactile, clicky) is quieter versions of the MX Green. Cherry X Super Black (Linear) is the stiffest since they require an actuation of 150 cN and is used as a spacebar for black switch keyboards. Cherry MX Black Silent (Linear) is a quieter versions of the MX black due to a rubber piece to reduce the sound. Cherry MX Speed (Linear) is paired with the Cherry MX Brown switch with the same actuation as an MX Brown. The only difference is that it is much shorter allowing you to make high speed keystrokes with lesser pressure on each key. The Cherry MX Speed is much faster to the touch and is often preferred by serious gamers. The switch types all depend on your preference. The lower the actuation, the more sensitive the keys are. An ideal actuation for gaming is 50 cN. They are quick to respond and they are also ideal for gamers who need keyboards that can keep up with demanding reflexes. The main difference between the two is that the mechanical keyboard has direct access to the switches underneath the keycaps while a membrane keyboard has a lining--or a membrane--that goes over the electrical circuit or the switches. We’re pretty sure we’ve already answered that question in the previous segment. Mechanical switches are pretty expensive because each key has their own switch and on every keyboard, there are also different types of switches used for different keys like the enter, space bar, and CTRL. An ordinary mechanical keyboard has about 103 to 120 keys but a gaming keyboard has about at least 130 keys. Aside from the expensive switches, the keyboard also considers the cost of the frame and the entire build of the keyboard. Furthermore, mechanical keyboards are often considered as premium keyboards and are thus built with metal frames than the typical plastic ones. On average, a keyboard can register about 1 to 2 key rollovers. The N Rollover is ideal for gamers because it can register commands that have more than two key rollovers. Gamers key in several controls at a time and the N Rollover key allows that to happen. The N key rollover allows your keyboard to press at least 6 keys at a time even as many as 8 rollovers. In simpler terms, the key rollover refers to the number of keys you can press all at once for certain programmed commands. Reactive typing, also known as type lighting, is when you type certain keys and the keyboard reacts by flashing a color or different colors. It can easily be adjusted and programmed according to your preference. For example, you’d like the keys to light up and shut off quickly after you click on a key. You can also program your keyboard to light up, flash in different lighting as a timer for certain gaming features or light up in different colors if you key in certain command controls. With the right programming and set-up, reactive is a beautiful convenience especially when you’re gaming. We all have the same question. Is buying a gaming keyboard really worth it? Typical keyboards without any advanced features can cost $3-$10, but from membrane keyboards to mechanical keyboards, the price really varies. A gaming keyboard starts from $30 all the way to $200. That’s a lot of money to pay for a keyboard, right? Well, the price isn’t really what matters. The most important are the features that they come with an advantageous boost you can get. If you’re a serious gamer, you buy the latest processor and the best graphics card or upgrading to a higher RAM. You also need the right equipment and that includes the best gaming keyboard you can find. A gaming keyboard offers faster reactive time to keystrokes, better command controls, gaming presets and additional features that gamers need like reactive typing, great macros, and better typing experience overall. Even though you’re not a gamer, upgrading your keyboard will definitely boost your typing speed, convenience, and total typing feel. You can plug it in any USB port but you will still get the same 2.0 port speed. We recommend that you leave the 3.0 USB port for other uses like plugging in your flash drive, your external drive, etc. Your computer’s 3.0 USB port is compatible with both 2.0 and 3.0 USB plugs. But since most computers come with both ports available, it is always better to stick with the ports that are available for your definite use--which is often the default 2.0. Though going wireless is really convenient for most players especially those who tend to put their keyboards on their laps, most mechanical keyboards don’t often come with a wireless version. One reason is that mechanical keyboards are already expensive as they are. Making them wireless would add to the cost. Secondly, mechanical keyboards use switches which function best when they are directly connected to where they will register the input. Making your mechanical keyboard wireless may affect the efficiency of your keyboard switches. Thirdly, you would have to consider the power that would sustain the keyboard. The heavy use of your keyboard comes at a price. If it so happens that you would own a wireless mechanical keyboard, it means that the battery source would quickly die out before you get to finish your serious gaming hours. And with the power being a consideration, you would also end up plugging it somewhere else to keep and sustain the battery needed to power up your keyboard. The Corsair is a high-end gaming keyboard that really adds a maximum leverage to your game with powerful responsiveness and durability. It comes with great material backing and high-performance speed gaming, better key control and customized commands. That said, this is a real winner for most gamers. The difference between these two top contenders in their own price ranges is that the Logitech wireless keyboard has reduced features in order to be more cost-effective and also to compensate for the fact that it is wireless. Since it is rare or rather uncommon to find a great wireless gaming keyboard, Logitech was definitely able to pull-off one awesome gaming keyboard with features that surpassed other wired keyboards within its price range. However, once compared to the Corsair K95, its features are definitely sub-par which includes backlighting--or the lack thereof-- command controls and built-in storage for profile presets and many other features that most gamers would want to have. The Razor Ornata Expert is a surprisingly wonderful gaming keyboard despite its incredibly cheap price. For less than $100, you can practically get almost all of the features that you would need and search for from a high-end gaming keyboard. It offers a full-color programmable backlighting, mid-height keys for quicker responsiveness and great anti-ghosting properties. On the downside, the Razor synapse proves to be quite a hassle for some since it offers endless configs for the backlighting. That makes it feel more difficult to DIY your preferred backlighting effects, something that Corsair K95 gives your better controls over. The Corsair, on the other hand, is really made for gaming efficiency and quick set-up. So whether you’re a real gaming professional or just a newbie--or maybe just someone who is looking for a high-end keyboard for better working experience, you can still program your custom backlighting with barely any hassle at all.